- Barry M - Matt White. - Essie - Navigate Her. - W7 - Black . 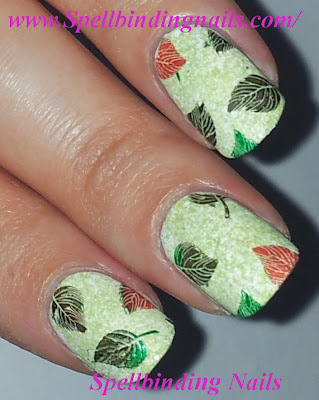 - My Online Shop - Stamping Polish Green. - Konad Polish - Dark Orange. I did this manicure *very* last minute - but love how it turned out! - After applying a base coat, I applied two coats of Barry M's Matt White. - I then sponged Essie's Navigate Her all over my nails. 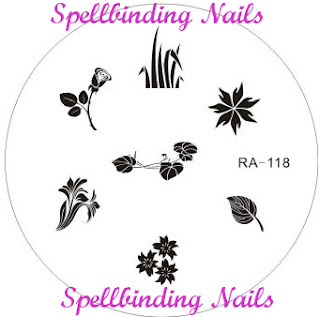 For this Manicure I used RA 118. * Only available within the US. **I purchased this set before they stopped posting internationally. so pretty! the sponging adds so much dimension! Beautiful! 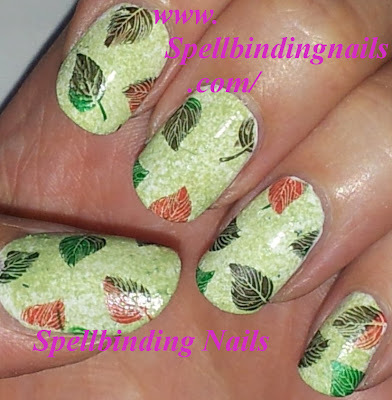 I love the sponged texture background you did for the leaves! Love the colour variations you did for the leaves as well! What a gorgeous combination! Perfect for the season and so richly textured. Fabulous! gorgeous! i love the different colors of leaves!!!! Wow! This is gorgeous and so creative.